hen General Overseer A.J. Tomlinson recorded the minutes to the fourth General Assembly in 1909, he reported: “Some more thoughts advanced about a church paper but the assembly came to no conclusion.” Hidden in those words was the birth of The Church of God Evangel, now entering its centennial year of ministry. Overseer Tomlinson had long recognized the importance of the printed word in spreading the gospel. In 1894 he and J.B. Mitchell formed the Book & Tract Company to distribute Christian literature and provide revenue for home missions. Five years later Tomlinson relocated from Indiana to Culberson, North Carolina, as a colporteur and missionary to Appalachia. By the fourth General Assembly Tomlinson had already been involved in editing three periodicals. In 1901 and 1902 he published a monthly paper called Sampson’s Foxes. The paper featured articles and news from Tomlinson’s mountain missionary work as well as the holiness and divine healing movements. Tomlinson believed that if he could reach the mountain children, then like Samson’s foxes burned the fields of the Philistines, his ministry would burn the sin out of the mountains. Beginning in January 1904 Tomlinson and M.S. Lemons launched a short-lived newspaper called The Way with the words of Jesus as their motto: “I am the way, the truth and the life.” The Way promoted the doctrines of salvation, sanctification and divine healing. 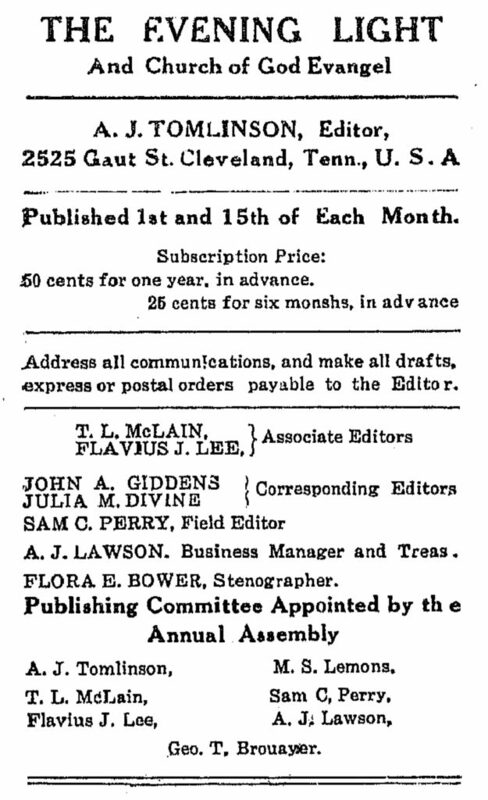 But in September 1905 the editors noted they were publishing the final issue of The Way in order to give their time to pastoral and evangelistic work. Among many publications that emerged in the early Pentecostal movement was G.B. Cashwell’s The Bridegroom’s Messenger, established in 1907. Cashwell had received the baptism of the Holy Spirit at the Azusa Street Mission in Los Angeles and preached in Cleveland, Tennessee, in January 1908. Tomlinson became a corresponding editor of The Bridegroom’s Messenger following Cashwell’s visit to Cleveland. But Tomlinson’s sights were already set on a publication for the Church of God. In January 1910 the fifth General Assembly appointed a committee to draft a recommendation. Two days later the assembly appointed a publishing committee. The first issue of The Evening Light and Church of God Evangel was dated March 1, 1910. Its name was based on the prophet Zachariah’s words “at evening time it shall be light,” a common explanation for the emergence of the Pentecostal movement. Tomlinson was the editor of this weekly publication, and the cost was 3 cents per copy or 50 cents for a year’s subscription. There were 125 initial subscribers. The name was abridged to The Church of God Evangel the next year. Editors, format and frequency of publication have changed from time to time, but the Church of God continues to faithfully publish the light of the gospel.